Samsung has urged owners of its Galaxy Note 7 phones to stop using or exchange the devices as they risk exploding. And airline passengers were warned by US authorities not to switch on or charge the phones while on board. The South Korean company said it would replace all devices that were handed in from 19 September. A statement by Samsung, the world's biggest mobile phone maker, said "our customers' safety is an absolute priority". "Until a replacement device is provided, Samsung asks all customers with a Galaxy Note 7 smartphone to power down your device and return it to its place of purchase at your earliest opportunity," the statement added. Earlier on Saturday, aviation authorities in the United Arab Emirates banned use of the devices on the Emirates and Etihad airlines. Similar bans had already been put in place by Singapore Airlines, Qantas and Virgin Australia. The US Federal Aviation Administration (FAA) also advised against packing the phones into any checked-in luggage. 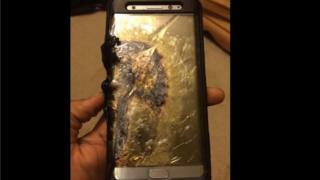 US TV channel Fox 10 reported claims that a faulty Galaxy Note 7 had set fire to a family's Jeep.